When you think of whales, you may imagine a large, lumbering creature with the girth of a school bus. Indeed, blue whales, the largest of the species, can reach 80 to 90 feet, but most whales are considerably smaller. Scientifically categorized under the order cetaceans, whales fall into two suborder classifications — toothed whales and baleen whales. The suborder of toothed whales contains most of the smaller whales, and this group incorporates dolphins. According to the Convention of Migratory Species, there are 72 toothed whale species. Outside the dolphin family, the smallest toothed whale is the dwarf sperm whale. The suborder of baleen whales is characterized by mammals with baleen plates for filtering plankton from water, rather than having teeth for feeding. The smallest baleen whale is the pygmy right whale. Dwarf sperm whales are of the cetacean family Kogiidae. They grow from 8 to 9 feet and weigh between 300 and 600 lbs. This species has a compact, stout body that narrows toward the tail. 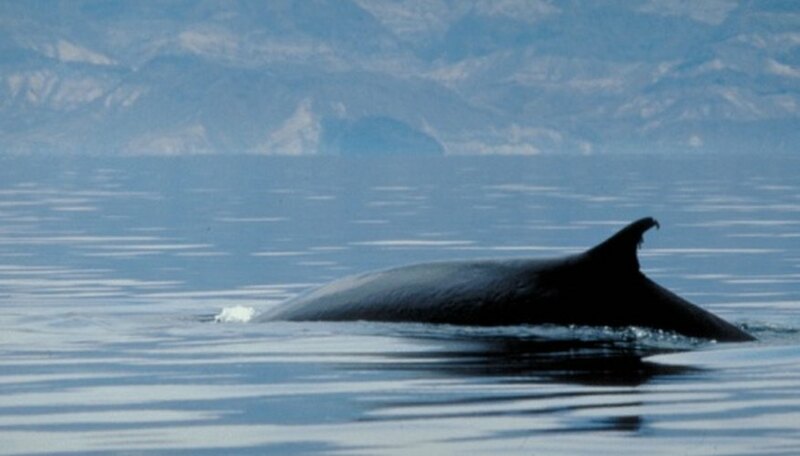 The dorsal fin is located midway down the back, with slight variations in shape for individual whales. Dwarf sperm whales have a sharklike snout that is pointed and conical. They have three pairs of teeth in the upper jaw and between seven to 13 pairs on the bottom. The flippers are wide, short and located toward the front of the body. Dwarf sperm whales are brownish to darker blue-gray and lighter, almost white-pink on the underbelly. Dwarf sperm whales have a single blowhole. 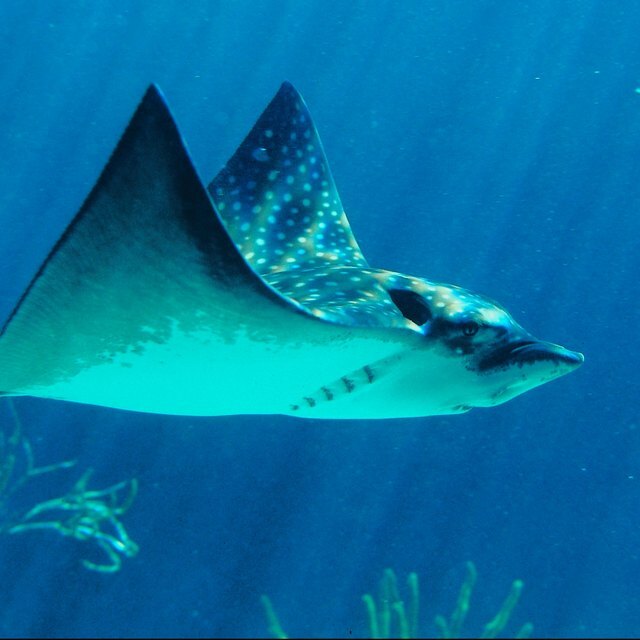 While at the surface, they have a flat profile due to a level head and back. Their surface breathing offers no display and because of their shy behavior, dwarf sperm whales are rarely seen. They travel alone or in small groups of six to 10 animals. It is uncommon to spot them from a boat, and the lack of surface activity makes them difficult to study. The pygmy right whale is the smallest and most enigmatic of all baleen whales. Very little is known about this whale species, since only a few dozen specimens have been examined by scientists. Their almost identical appearance to the minke whale makes purposed sightings questionable. Pygmy right whales average 21 feet and weigh a maximum of 10,000 lbs. They are dark gray on top, and the underside is white. On the flanks of the pygmy right whale are two chevron-shaped markings. They have a small dorsal fin located toward the rear end of the body. The small, narrow flippers are darker gray than the rest of the body and the tail fluke is notched in the center. Pygmy right whales have been sighted in Tasmania and on migratory routes along the coasts of southern Australia, New Zealand, the Falkland Islands, South Africa and in some areas of Antarctica. This whale species is spotted singly or in pairs, although groups of up to 80 whales have been witnessed. Pygmy right whales do not exhibit breaching behaviors, nor do they display their flukes. Also unlike other whales, pygmy right whales swim by body undulation, (full body movements) rather than with repetitive tail thrusts. If considering dolphin along with the order of whales, the smallest is the Hector's dolphin. This marine mammal grows to a length of 4 to 5 feet and weighs a maximum of 110 to 120 lbs. Hector's dolphins are found only in the coastal waters of New Zealand and are bordering on extinction. According to the World Wildlife Fund, only about 7,400 of these dolphins are left in the world. Hector's dolphins are easily recognizable with their rounded dorsal fin and distinct coloration. Their sides and back are light gray, and they have white streaks along their sides. The underside is light, almost white, while the face, fins and tail are black. On the face of the Hector's dolphin is an easily identifiable crescent-shaped mark. A., Valerie. "Small Whale Species." Sciencing, https://sciencing.com/small-whale-species-8655015.html. 24 April 2017.